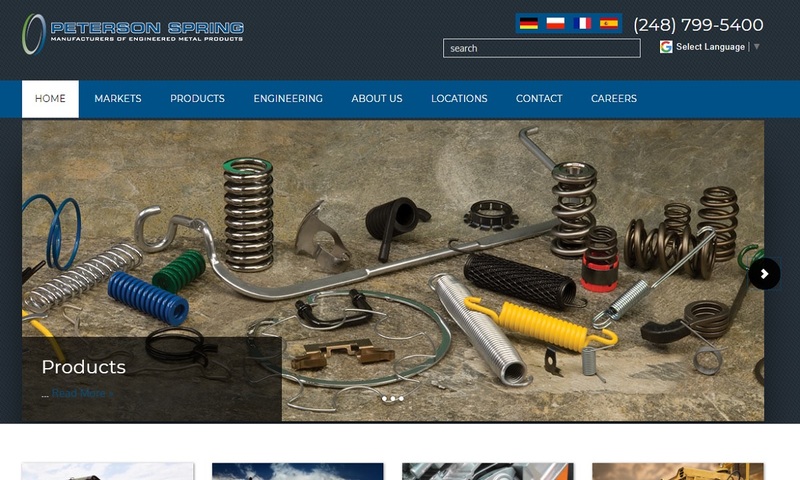 A reliable source for Spring Manufacturer information and a resource for accessing leading Spring Manufacturer and suppliers. A spring is an elastic device that stores potential energy while at rest, and applies a resistant force when compressed or stretched. Springs are a necessary component in many devices, machines, and systems. Springs are used to store and absorb energy and maintain force or tension in the applications for which they are designed. Some of these applications include: circuit breakers, ballpoint pens, paper clips, solenoid valves, writing instruments, medical devices, electronic lock systems, precision springs in MEMS (micro-electro-mechanical systems), and electronics. Industrial springs can even be used to earthquake-proof foundations for high rise buildings. Springs A spring is an elastic device that stores potential energy while at rest, and applies a resistant force when compressed or stretched. 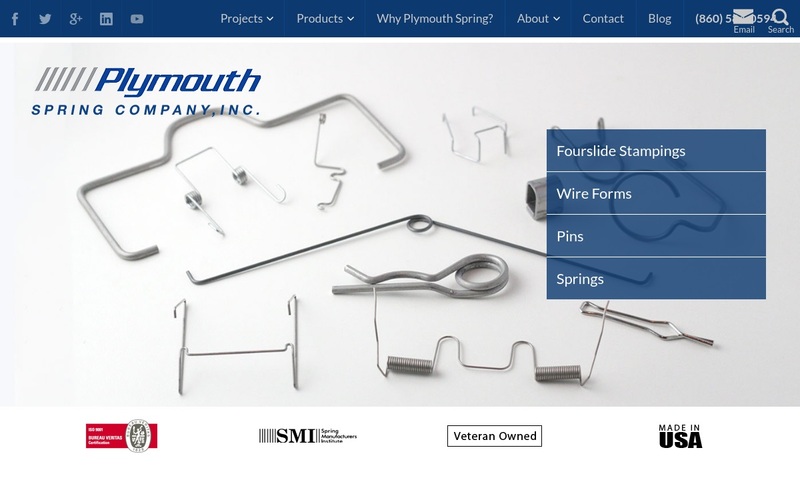 Plymouth Spring Company, founded in 1959, has continued to expand and grow through new technologies and attention to details to serve an ever larger customer base. In business since 1927, Century Spring Corp. maintains 30,000+ spring designs. We also manufacture custom springs. For your compression springs, die, disc, extension springs, specialty, tapered and torsion springs, Century Spring is your full-service source. Do you need springs? 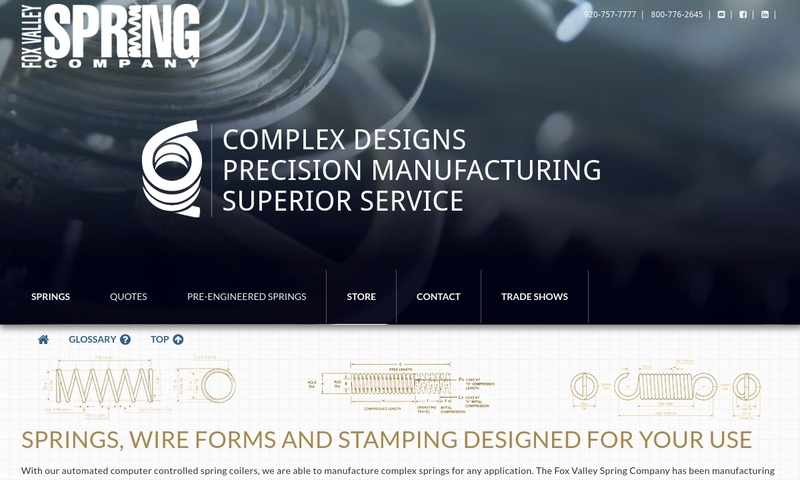 Since 1989 Fox Valley Spring has been manufacturing compression, extension, torsion, die, flat steel and custom made springs. As an ISO 9001:2008 certified company, you can trust our fast design and quality service. 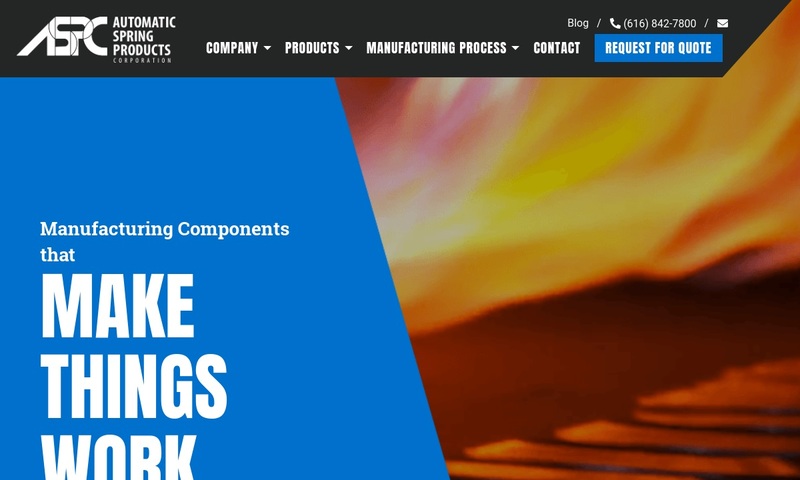 Automatic Spring Products is a manufacturer of custom designed wire forms, stampings, spring & shim washers & assemblies, as well as quality springs. Being ISO 9002 and QS 9000 registered, Peterson Spring is known for high-quality springs and service. In business since 1932, we produce custom compression springs, flat springs, extension springs, and torsion springs. There is little information recorded about the early history of springs. Much of what we know of its beginnings we have gleaned from artifacts. For example, during the Bronze Age, people invented one of the first spring-based tools, the tweezer. These tweezers consisted of two strips of metal and a small plate brazed between them. Other early spring-based tools include pincer pliers and simple tongs. We also know that, during the Iron Age, King Tut used leaf springs to make his chariots run more smoothly and last longer. In the 1700s, the French also used leaf springs on their carriages. In 1493, Leonardo da Vinci designed and manufactured a gun with a hammer spring, which allowed people to shoot the gun with one hand. He is credited as the first to make a gun using this spring. Next, in 1680, British physicist Robert Hooke discovered the principle upon which springs work. Known as Hooke’s Law, this states that “the amount of force (F) required to extend or compress a spring by some distance (X) is linearly proportional to the distance, where the constant (k) represents its stiffness.” When you apply pressure, the force develops into stress. The stress then creates deformation, known as stress. The official formula for Hooke’s Law is: F=kX. Around 80 years later, in 1763, R. Tradwell invented the first coiled spring. Users were thrilled because the coil spring requires far less maintenance than the leaf spring, which had to be lubricated frequently and squeaked loudly. In 1857, during the height of the Industrial Revolution, the steel coil spring was patented in the United States for use in chair seats. Shortly after, in 1871, a German man named Heinrich Westphal invented the innerspring mattress. Sadly, Westphal never profited from his work and died in poverty. In 1943, Richard James, a naval engineer, came up with the idea for the Slinky, the coil spring that sells as an inexpensive child’s toy. He got the idea while working on developing springs that could support sensitive ship instruments and stabilize them on high seas. As he worked away, he accidentally knocked a coil off a shelf. The coil, instead of simply falling, walked down a stack of books, across a table and onto the floor, where it recoiled into an upright stack. Betty, his wife, named it “Slinky” for its smooth, graceful movement. Since then, metalworking and heat-treating technologies have advanced significantly. Spring manufacturing has improved alongside them. Today, springs are available in more shapes and sizes than ever, with greater load resistance and more durable elasticity. Spring manufacturers fabricate their products using a wide range of wires and metals, including: tempered steel, spring steel, cold spring steel, music wire, stainless steel, magnet wire, hastelloy, molybdenum, titanium, copper, bronze and thermoplastics. The choice of what material to use depends on the application and production method. Spring steel, for example, is a popular spring material, because of its elastic properties and its high yield strength. Manufacturers like using music wire for its uniform strength and inexpensive cost. Stainless steel is a popular choice in the pharmaceutical, food and beverages, and medical industries because of its chemically resistant properties, and its smooth, easy-to-sterilize surface. While the wire spring is most popular, for corrosion resistance and noise reduction, manufacturers will use thermoplastics, if possible. For applications that deals with sudden, significantly heavy loads, manufacturers prefer braided wire material. Manufacturers make springs using either the cold rolling process or the hot rolling process. In the cold rolling process, the wire that is used can be up to 5/8” in diameter. In hot rolling, manufacturers can coil and fabricate into springs straight bars of steel up to 6” in wire diameter. These are ideal for shock absorption. They can also use lightweight and micro wire, which can be as fine as .01” and .002”, respectively. Manufacturers can form stronger springs using flat and square wire, in addition to round wire, and tubular stock, which is also a popular material. They usually make industrial springs from thick wire, while they make smaller springs from wire that is flexible and thin. Some of these springs are too small to be seen by the naked eye. When designing and customizing a spring, manufacturers think about: projected spring rate, projected physical dimensions and projected finished product load. They carefully design the spring’s material, size and function, as the potential energy that a spring stores can depend on these details. To achieve adequate load handling, they’ll calculate the number of active coils. To perfect a custom spring for your application, manufacturers can add things like: surface treatments, coatings, surface hardening, out surface coloring and other treatments for corrosion and wear resistance. Springs come in four main styles, which are compression springs, extension springs, torsion springs, and flat springs. Other types include: coil springs, leaf springs, constant force spring, conical springs and gas springs. Coil springs are also known as helical springs. This category of spring gets its name from the method by which it is produced. The coil spring production process involves winding a spring wire around a cylinder to create a helical shape. For specified applications, these springs can be made from steel or stainless steel. Extension springs, torsion springs, and compression springs are types of coil springs, also known as helical springs. Compression springs act as a cushion when a downward force works against it. Spring compression provides shock absorption. Two common examples of a compression spring are bed springs and the springs used in suspension transportation systems. Extension springs, on the other hand, do the opposite. These springs elongate and exert resistance when pulled by outward forces on both sides. Most often, you can find them installed in a screen door, where they help keep the doors closed. Torsion springs exert pressure along a circular arc-shaped path, providing a twisting force known as torque. A familiar application that utilizes spring torsion spring is a mousetrap. Spring torsion can also be used with doors and windows. There are some springs that are not fabricated with coiled wire. Flat springs are one of them. Flat springs are instead made from flattened strips of plastic or metal, fabricated with a specific curvature. This curvature makes them capable of shock absorption and resistance. Leaf springs are a type of flat spring that consist of multiple layers of tempered metal strips. These springs are common in the automotive industry and can be found in heavy vehicles such as trucks and vans. The combination of a flat spring and a coil spring is known as a constant force spring. It consists of a long strip of sheet metal that retains its coiled shape after it has been wound, coiled, and heat treated. Constant force springs are ideal for long spring extensions, as they provide a consistent amount of kinetic energy as they coil and recoil. Applications where constant force springs can be found include: gardening equipment, fitness equipment, toys, and electric motors. Also known as tapered springs, after their shape, or conical compression springs, conical springs are designed to provide a near constant spring rate while under compression. Under maximum compression, the coils of a conical spring nest inside one another, creating a flat profile. By their nature, tapered springs offer greater stability and less load deflection. Usually, they’re used as electrical contacts and in push buttons. For this reason, they’re typically made from copper or stainless steel, which provide heat and corrosion resistance. A gas spring is a spring that uses compressed gas instead of elastic deformation to work. The compressed gas is stored inside a closed container that is sealed by a sliding piston. There, it pneumatically stores potential energy and is able to withstand any external force that is applied parallel to the piston shaft. Gas springs are found in automobiles, office chairs and a variety of aerospace, medical and furniture applications. Also, especially large gas springs are used in industrial manufacturing equipment, like presses. There are so many reasons to choose springs for your application. First, they are versatile. Each standard spring variety has subtypes or can be customized to fit your application. Second, springs are inexpensive, as they are generally small and made from low-cost materials. Featuring one-piece design, they are also easy to fabricate. Another benefit of springs is that they’re surprisingly lightweight. Their lightness does not take away from the fact that they are incredibly powerful, though. Finally, springs do not require maintenance. On the occasion that one does break, it will be easy to replace. Your accessories depend on your application and the type of spring you select. Some possible accessories include: spring mounts/seats, coil spring isolators, felt inserts, ball studs, end fittings and other hardware. The stronger the elasticity of a spring, the more likely and efficiently the spring will return to its original shape. If the spring steel is properly tempered, the spring will be able to indefinitely retain its elasticity. Springs may lose its recoil over time if they are overextended or used too heavily. You should, at minimum, purchase springs that meet working and safety standards like those put out by SAE, ASTM, ISO and AISI. 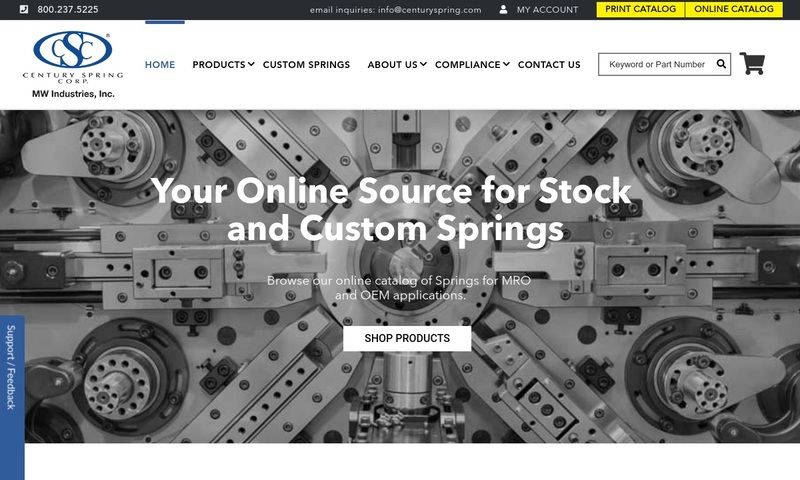 Depending on your industry, application and location, there may be other standards to which your springs must adhere, like Boeing-AQMS, Mil-specs or EN standards. Before placing an order, make sure that your manufacturer can create spring products with the appropriate standard certification. Springs are simple but mighty. For the best results, you need to work with an experienced and reliable manufacturer who is in tune with your needs. To help you get started, we put together a comprehensive list of industry leaders that can meet a wide range of requirements. To help you narrow down your choices, we offer this advice: Before doing anything else, put together a list of your specifications, requirements and any questions.  Make sure to include: your application, your spring’s projected load weight, the physical dimensions of the product your spring(s) will be supporting, details about the environment (corrosive, outdoor exposure, sterile, etc. ), your budget, your deadline and your delivery preferences. Once you have your list ready, pick out three or four of the spring manufacturers we have listed here that you feel best match your specifications. Then, reach out to each of them individually. Discuss your application at length. Leave no stone unturned; a quality manufacturer will be happy to make sure you understand one another well. Once you’ve done that, compare and contrast your interactions. Which manufacturer displayed the best customer service? Which one had the capabilities to best serve you? The right manufacturer will be in the sweet spot, offering both superior manufacturing capabilities and superior customer service. We’re confident that manufacturer is in this group. Good luck!